Like most of the Samsung's current lineup, the Galaxy Beam (still) finds itself firmly in the land of Gingerbread, accompanied by the ever-familiar, but, by now, rather dated TouchWiz 4.0 UX. The lockscreen of the Galaxy Beam has the usual integration of missed events but doesn't go any further. It's the "drag your finger outside of the circle" type of lockscreen but no shortcuts like on the Galaxy S III. You do get music player controls though. The homescreen accommodates plenty of widgets with lots of functionality. You can have up to 7 homescreen panes. A pinch zoom provides an aggregate view of all homescreen panes, which can be rearranged, deleted or added. In typical TouchWiz fashion, there are four shortcuts docked at the bottom of the screen that are visible both on the homescreen and in the app drawer. The first three are user-configurable (Phone, Contacts, Messaging), the fourth one being locked. It's the app drawer/home shortcut so it makes sense to always keep it in the same place. Adding widgets, shortcuts, folders or changing wallpapers is via a context menu that pops up on demand at the bottom of the screen. The list of available widgets can be swipe-scrolled while providing a smooth animation throughout. You can also swipe each of the homescreen panes. The app drawer is very similar to the homescreen - you can create folders and pages by dragging them to the appropriate icon at the bottom of the screen. You can also rearrange pages from the same aggregate view as the homescreen. List view can be enabled in the app drawer instead of the regular grid view. There's also a preview of all your app drawer screens for quicker browsing. The notification area has toggles that give you easy access from anywhere in the interface to the following functions: Wi-Fi, Bluetooth, GPS, silent mode and screen auto-rotation. With the Galaxy Beam I8530 you get a standard Android task switcher with the traditional Samsung modification - it has a button to launch a task manager. The custom task manager offers a lot of functionality, such as seeing what sort of RAM footprint your apps have, or how much storage is available. It also comes with a handy widget, which shows you the number of active applications right on your homescreen. 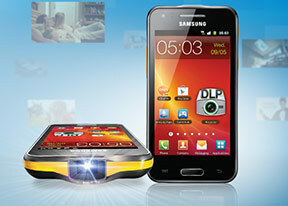 The Samsung Galaxy Beam I8530 is powered by a NovaThor U8500 chipset with a dual-core 1GHz processor. With 768MB of RAM and Mali-400 GPU, the overall performance should be enough to hold its own amongst midrange smartphones. However, the projector not only adds a few millimeters around the waist, but it also swells the price a bit. That's why in this test we've included some devices which can easily be defined as being in a higher-end category than the Galaxy Beam specs-wise, but fall within the same price point. Similarly, you'll see devices here which have a lower retail cost than the Galaxy Beam, but are included because they are very similar in terms of specifications. We've included both of these classes of devices to illustrate both what sort of value you can expect from other devices at this price point, as well as what sort of offerings are available if you're willing to forego the Beam's main selling point - the projector. Benchmark Pi measures processor performance, and has the Samsung Galaxy Beam sitting firmly in midrange territory. It handily managed to beat out the Galaxy Ace 2, which shares its chipset and GPU, but is clocked at 200 MHz lower. Unsurprisingly, the similarly-priced HTC One series phones and the Galaxy S III are a step ahead here due to their superior hardware specifications and updated Android builds. The same trend continues in the Linpack test, where only slight differences in RAM amounts differentiate the Beam from the two Xperia phones. The Galaxy S Advance is also on par with these devices. We were pleasantly surprised by how well the Galaxy Beam performed in our 3D graphics benchmark, NenaMark 2. It handily outperformed the other U8500-based droids, and the over-30fps rating is certainly adequate for 3D gaming applications. A more drastic division can be seen in the GLBenchmark offscreen performance test, as a huge jump can be seen between the NovaThor Gingerbread devices and the competition. Some solace can be taken in the fact that these tests emulate 720p resolution - something the Galaxy Beam will never have to run. In the SunSpider and BrowserMark tests, the Galaxy Beam performs the best out of the other Gingerbread devices, although results were fairly close amongst these devices, with the exception of the slower Galaxy Ace 2. ICS web optimizations and superior hardware specs account for the advantages the HTC devices and the Galaxy S III hold over the competition.